Before starting my own blog, I read other people's blogs. Beauty, hair, makeup, lifestyle, fashion, food, home decor, health- you name it. No matter what the topic, I love reading about others' thoughts and seeing what they care about enough to share with the internet world. One type of post that I always look forward to (especially from beauty bloggers) is their "monthly favorites". It's fun to see what products have stood out to other people throughout the month, and to see how those products change as the seasons shift. These types of posts are typically found on "beauty blogs", and are popular on YouTube as well. Although I'm not a beauty blogger, & I don't do YouTube, I thought I would join in on the fun & share some of my own favorites. Recipes are always my favorite things to share here on my blog~ I love food & sharing healthy tips with people. 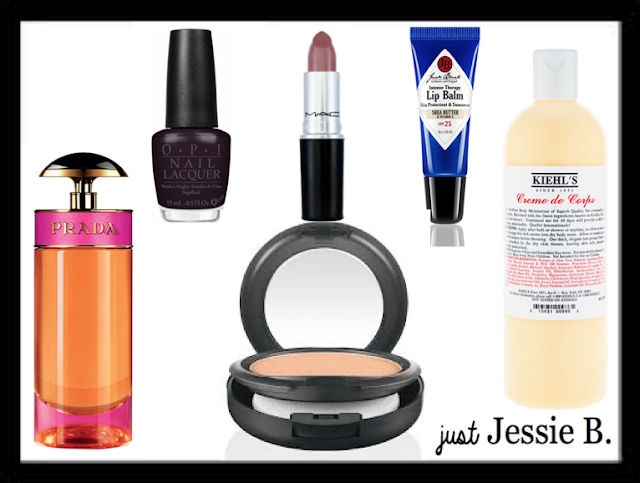 However, I love makeup & beauty products & all of those girly things, too! So, I figure I will share all of my loves here in one place. I love this lip balm for all-day wear and as a nighttime treatment. It's so moisturizing, yet not greasy, and has a great non-waxy texture to it. Since it's a men's skincare line, I have always purchased the mint version for my boyfriend, who loves it. My lips were feeling super chapped at the beginning of this month (probably the change in weather), so I picked one up for myself & have been loving it. I like the Shea Butter version, which I found at ULTA. Such an amazing long-lasting foundation, and SO easy to apply. I have been having major issues with oversleeping lately, so quick makeup has been a must in order to get me out the door in time for work. This foundation is a lifesaver, & lasts longer than any other powder foundation I've tried. Great for those super long work days when you don't have time for your makeup to budge! I have medium skin with golden undertones (as opposed to pink) & use the shade NC40. Don't get me wrong, I still love my Everyday Coconut; but this stuff is a bit more 'heavy duty'. I apply this after showering at night & it has been a godsend for the drier skin that comes with the cooler weather. It can feel a little greasy, but when I wake up the next morning my skin looks & feels awesome. It's expensive, but so worth it! This is one of my favorite perfumes all year round, but especially in the fall. It has a warm, sugary scent to it that makes me feel cozy & happy. My boyfriend noticed when I started wearing this again, & said I smelled really good~ so it's got the male stamp of approval. ;) Even a random stranger at my university health center told me I smelled good ("like sugar" to quote him, haha!). Go give it a sniff next time you're in Nordstrom or Sephora! OPI Nail Polish in "William Tell Me About OPI"
Let me know your thoughts on "monthly favorites" posts, and if you think I should stick to beauty products or throw in some "others" (foods, drinks, candles, random items) too! Hope you all had a Happy Halloween!